Star Wars™ Battlefront™ Expansions – The galaxy far, far away just got way, way bigger. 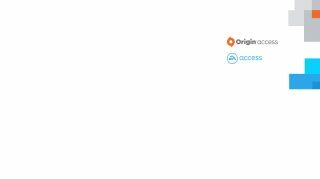 Now all four Star Wars™ Battlefront™ Expansions (Outer Rim, Bespin, Death Star and Rogue One: Scarif) are part of Origin Access and EA Access! Members can now play as every hero in the game - from Greedo to Lando Calrissian to Jyn Erso - explore every new map and dominate in additional game modes. Battlefield 1 – Battlefield 1 takes you back to the days of The Great War, WWI, where armies on horseback, massive tanks, and warplanes collided. See every corner of a world at war, join massive multiplayer battles and fight in totally destructible environments where no battle is ever the same. Titanfall 2 - Call down your Titan and get ready for an exhilarating first-person shooter adventure. Drop into a fresh single-player campaign that explores the bond between a Pilot and his behemoth Titan companion, or blast your way through the kinetic multiplayer mode where speed means everything. FIFA 18 Play First Trial - Powered by Frostbite™, FIFA 18 blurs the line between the virtual and real worlds, bringing to life the players, teams and atmospheres of The World’s Game. Go on a global tour in The Journey: Alex Hunter Returns or dive into the stunning multiplayer - and do it all before official launch. The Sims™ 4 Digital Deluxe Edition - Enjoy the power to create and control a wild cast of characters. Customize your Sims' appearances and personalities. Build them the perfect home, choosing your favorite design and décor options. Help them pursue careers, develop skills and build relationships with other Sims. It's up to you who your Sims will become! Oxenfree – In Oxenfree you play as Alex, a bright, rebellious teenager who brings her new stepbrother Jonas to an overnight party on an old military island. The night takes a terrifying turn when you open a ghostly gate spawned from the island’s cryptic past. How you deal with these events, your peers, and the ominous creatures you’ve unleashed is up to you. Rebel Galaxy – Go on a swashbuckling space adventure, with action-packed combat, exploration, discovery, trade and “negotiation” with the outlandish denizens at the edge of the known universe. Choose your path as a roguish do-gooder, crafty space-trader or power-hungry privateer – or maybe a little of each! Madden NFL 18 Play First Trial – Experience Madden like never before. Control who gets the ball and when with all-new target-passing. Choose from three new Play Styles or play the best real world match-ups each week in Play Now Live. Members get to hit the field and start practicing days before release. NHL® 18 Play First Trial - NHL 18 delivers the speed, creativity and action of today's young NHL superstars. Play the arcade-inspired 3-on-3 NHL™ THREES mode, or create your own custom team with the new Expansion Draft. Do it all with the most co-op and competitive multiplayer options ever in an EA SPORTS™ NHL game, and start testing it out before launch day. NBA LIVE 18 Play First Trial – Become the greatest basketball player on the planet in NBA LIVE 18. Take on THE ONE, an all-new, dynamic career experience centered on your player, your choices and your legacy. Become a legend by mastering your role on the court, traits and signature abilities only you can pull off. Origin Access and EA Access are each just $4.99/month or $29.99/year. For more information about member benefits – including a 10% discount on EA digital purchases – please visit www.origin.com/store/origin-access and www.ea.com/eaaccess.